Episode 490: How to sell a $30,000 sponsorship (Part 2), with Stephen Woessner. Stephen is the CEO of Predictive ROI and the host of the Onward Nation podcast. He is the author of two bestselling books, speaker, trainer, and his digital marketing insights have been featured in SUCCESS, Entrepreneur, The Washington Post, Forbes, Inc. Magazine, and other media. Good Morning Onward Nation – I’m Stephen Woessner and welcome to Episode 490 — and today’s vital priority is to serve up Part 2 of how to sell a $30,000 podcast sponsorship. A couple weeks ago…I promised to you that I would invite Dave Mammano, host of The Avanti Entrepreneur podcast back to Onward Nation to share his personal story of how he sold a $30,000 annual podcast sponsorship to the company, Paychex…and today’s the day Onward Nation. I interviewed Dave in order to capture and document his exact step-by-step recipe so that you could apply it into your business straight away. I am so fired up to share the details with you. Let me first share a brief backstory in order to give you full context regarding why what you are about to learn from Dave can be so impactful in your business. Many Onward Nation listeners are business owners whose primary focus each day is to drive business development for their company. To drive new revenue, from new customers, and within new markets. 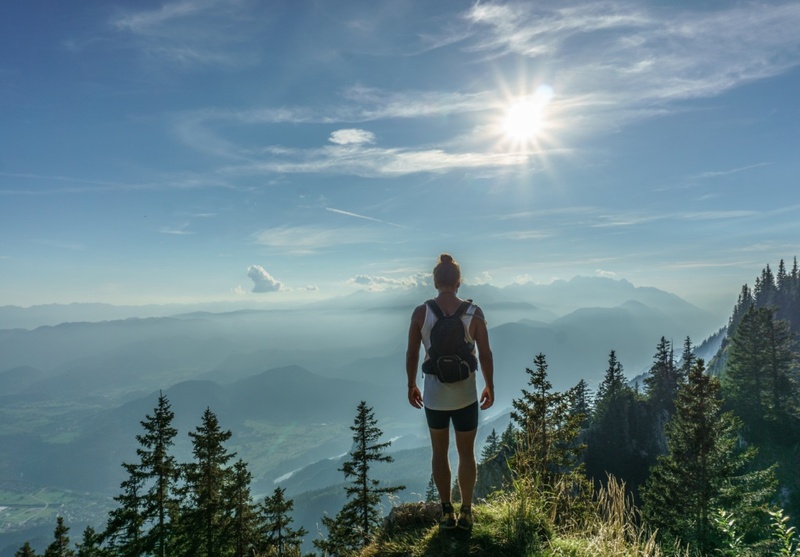 All of that is consistent with the small business revenue data we consistently see…that points to how 43 percent of owners are cite growing revenue as the top challenge within their company – so – winning at biz dev needs to be at the forefront of an owner’s vital priorities. And breaking down the 43 percent for a second – that number – 43 percent – represents over 12 million business owners in this country who are concerned about growing revenue. One of the proactive and super successful biz dev strategies proactive business owners have implemented is to put a podcast out in front of their core business – and then – to use their show as I like to call, a Trojan Horse of Sales – meaning – their podcast drives new client revenue into their core business by opening up biz dev relationships with the guests they interviewed for their show. 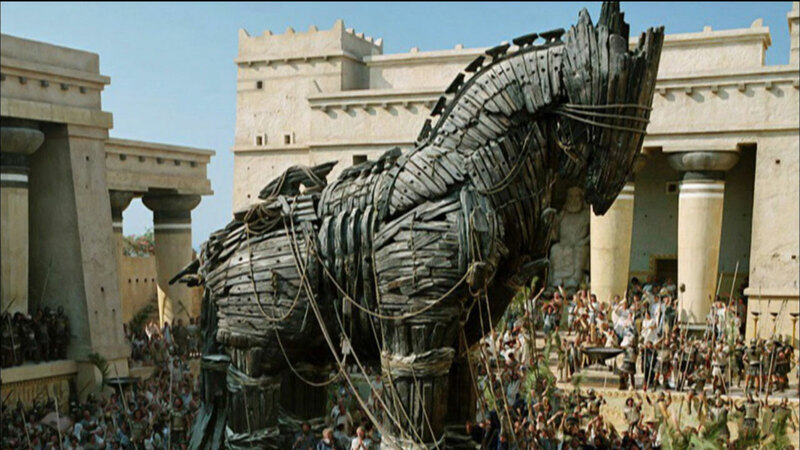 If you haven’t started your own podcast – but – you like the sound of having a Trojan Horse of Sales out in front of your business – then I encourage you to go back to Episode 445 of Onward Nation for the full recipe – in complete transparency – so you can take and apply all of the step-by-step ingredients. And then, several weeks ago, I took our biz strategy even deeper during Episode 460 by taking you on a deep dive into how to get a $10,000 to $100,000 sponsor for your podcast. But – I want to make sure I am very clear here – the recipe I shared in Episode 460 was not my recipe. It is a recipe I learned directly from the brilliant and super talented Linda Hollander. Linda is one of today’s leading authorities on how to sell sponsorships to top tier sponsors – and – our incredible guest on Onward Nation and she was kind enough to let me pick her brain for Chapter 16 of my upcoming book. Linda, if you’re listening, you are a rock star – thank you for everything! Now, Linda’s sponsorship recipe is not just any recipe – it’s a recipe that can help you sell a $10,000 to $100,000 sponsorship for your business. No hyperbole. It is truly that awesome. And that is where Dave Mammano comes in. Dave decided to sit down and really study Episode 460. He wanted to learn from Linda all about how to get a sponsor for your podcast – and then – he immediately…and I do mean immediately, applied what he learned. And when he was all done – he went out to sell it. Then Dave called me a few days later and let me know that he sold a $30,000 podcast sponsorship. Yes, Onward Nation – Dave sold a $30,000 annual sponsorship that stretched over his podcast, YouTube channel, all of the other properties within his business. Definitely an incredible result outcome for Dave – but – it is also a real testament to the community, purpose, and high-quality content his Avanti Entrepreneur team are building. 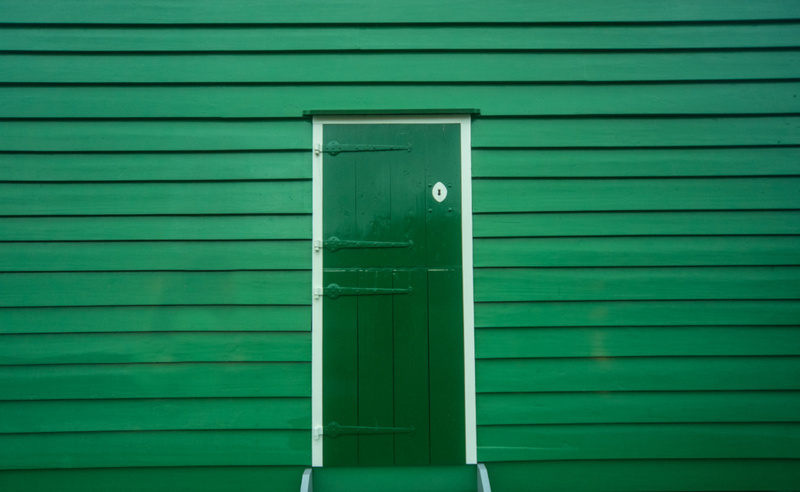 And one of the most incredible aspects of the sales process is that the negotiations with the sponsor were never about monthly downloads, website traffic, social media shares, or email optins. Instead, the focus was about building relationships – about aligning the sponsor’s brand with Dave’s content and his ever-growing nation of true fans because both companies serve the same customers. So Onward Nation, your ability to sell your own $30,000 or even a $50,000 sponsorship, or a $100,000 sponsorship rests solely on you creating “properties” and platforms that attract the prospects and customers who your sponsor wants to be doing business with – and – that you create the type of culture a prospective sponsor wants to be aligned with. That should be your biz dev strategy, Onward Nation. And of course, it’s exciting to think about building a YouTube channel with hundreds of thousands of subscribers or a super popular Instagram account. But for most small business owners…becoming Internet famous…is not what is going to move the needle…and it shouldn’t be your vital priority. To be clear…I am not saying credibility on social media doesn’t matter in monetizing your content…but…what I am saying is that just because you don’t have a million followers, doesn’t mean you can’t build an incredible core business where sponsors will absolutely want to pay you $50,000 to be part of the special relationship you are building with your customers and nation of true fans. What you do need above anything else is the confidence to know that it is possible. That you can do it. That you can be successful. That you can deliver value to a sponsor. That you have built an audience, a customer base, a loyal following – no matter the size – who value you, who love you, who appreciate your opinion, your insights, and they look to you for guidance. You have so much to be grateful for. So now I am going to share with you the conversation I had with Dave Mammano – so you can hear in his own words – the process – the recipe – the step-by-step of how he sold a $30,000 podcast sponsorship so you can follow the exact same steps. Here we go, Onward Nation! Stephen: Okay, Dave…so give us an overview of your story for Onward Nation listeners who haven’t heard you yet — or have that experience with you yet — even though this is your fourth visit back to Onward Nation, which is super exciting. I launched it in Rochester, New York in my hometown. We printed 10,000 copies in our first run, gave them free to the local high schools, and we made our money selling advertising — mostly to colleges. Then we took the magazine nationwide. We ended up doing 17 regional editions around the country and in every state…over 20,000 high schools…and we printed the magazine five times a year. We reached about 3 million high school students per year with print, online, mobile, digital…nearly all channels you could think about. And then in 2013, we ended up retiring the print because the digital revolution made it necessary to change the rules. We re-launched many different ways of serving high school students with college planning with the Next Step brand. And then…about a year and a half ago I got a call from a 25-year-old guy who called to thank me because I helped him start a business five years before. Back then, he was graduating college, he wanted to pick my brain, so we met for coffee. He brought a notepad and asked me a ton of questions about starting a business. I was blown away. First of all, he was nice enough to remember and give me a call just to say thank you. And second, that he actually listened to me, which is always exciting. 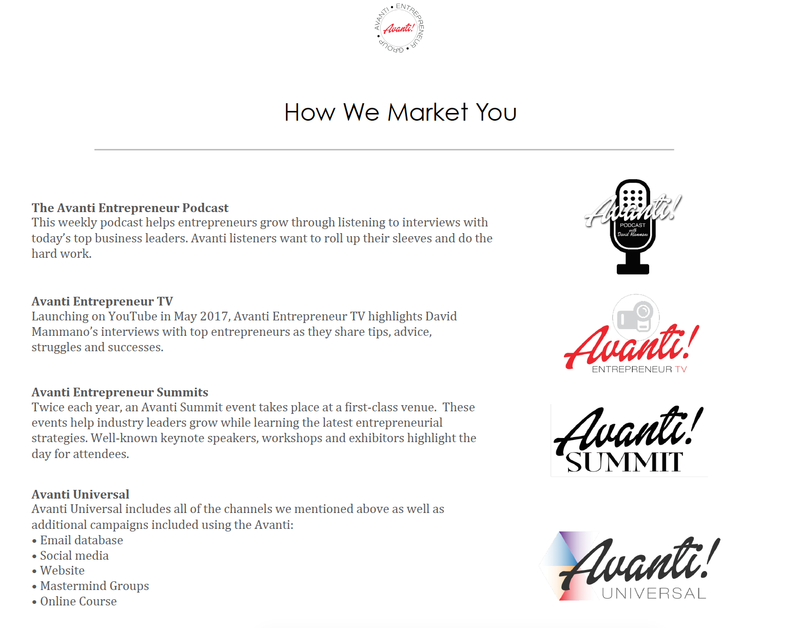 So I started what is now called the Avanti Entrepreneur Group and Avanti in Italian literally means ‘to go forward.’ So it’s almost like your podcast; Onward Nation. People say Avanti meaning onward. And also, in my mind, it meant next step, which is a nice little cousin name, right, to Next Step Magazine. So it’s all about forward movement. And so where we are today in the 18-months, we’ve done a lot. And a lot of it I owe to you, Stephen. I have a weekly podcast now called the Avanti Entrepreneur that you and the great folks at Predictive ROI produce for me. I just love doing my podcasts, I love interviewing people, I continue to learn, I continue to help my listeners. We’re also starting a TV show for entrepreneurs where I’m going to be interviewing really successful entrepreneurs. 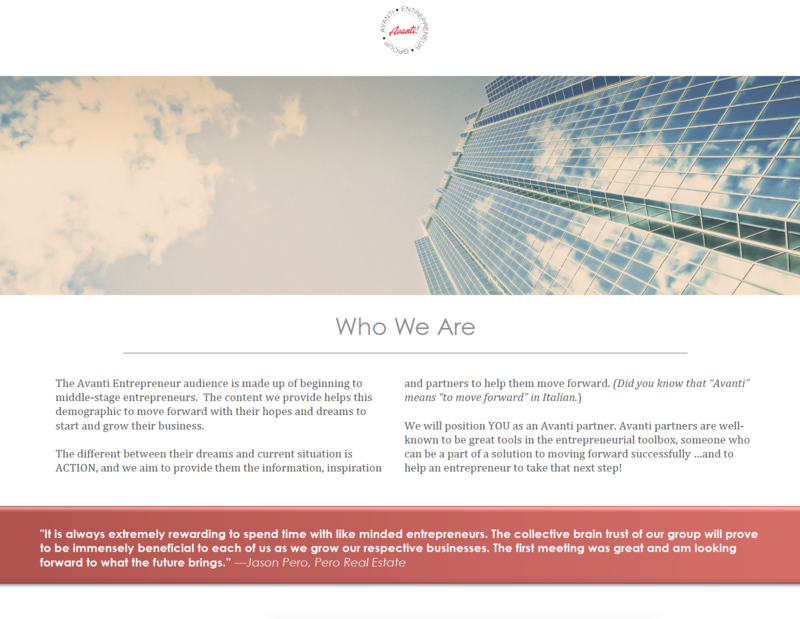 We’re thinking about restarting a magazine for entrepreneurs; Avanti Entrepreneurs Magazine. We do events for entrepreneurs. 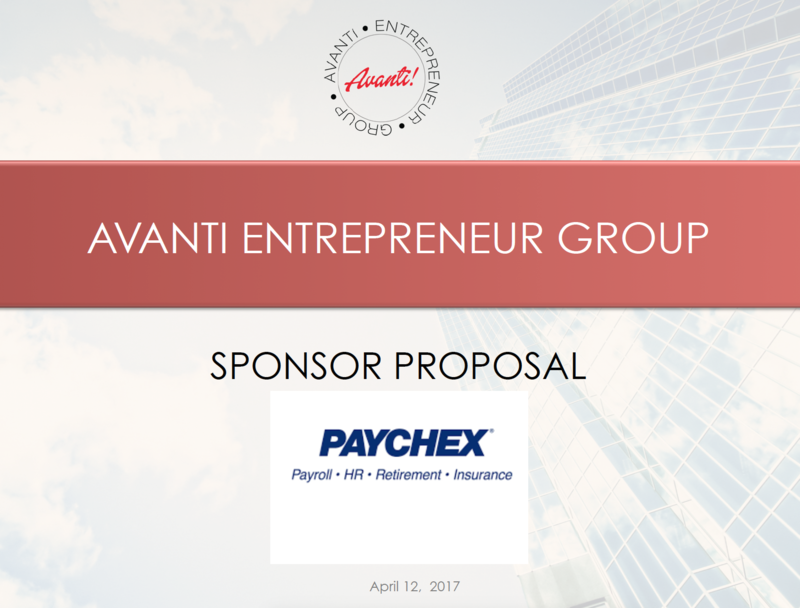 We have Avanti Summits where we bring in speakers and we have all these sponsors that are related to helping entrepreneurs as well. And I just launched an online course. It’s an online course that really infuses entrepreneurial thinking and strategies into culture and sales and marketing and mission and values and really gets people to take a deep breath about everything that it takes to run a successful business and purposefully plan, I’ll say instigate a plan of success. Stephen: Great context and that gives Onward Nation business owners a good foundation to know where you’ve come from, what you have built, which is significant. Let’s take Onward Nation way behind the green curtain here. So when you thought about the potential opportunity, did you ever think that it was unattainable? Did that imposter syndrome ever creep in and try to keep you from that destiny? Dave: It did. In my mind, I thought, ‘Well, I just started my podcast.’ It’s not even a year old, I just started it in October, ‘Who’s going to want to sponsor me? Bank of America’s not going to want to sponsor my podcast.’ And you know me, I’m a pretty optimistic and aggressive guy, but yeah, even me, I just didn’t have the self-esteem in what I was doing yet to say, ‘Oh, this is worth $30,000,’ right? And then I listened to Onward Nation and heard your solocast with Linda Hollander’s recipe. If you haven’t listened to that episode — please go and listen to everything Stephen’s done with Linda. I just acted like a very good student. In your solocast, you recapped everything that she had done. And it was a great lesson for me. And I started writing things down. And that keyword, it really just hit home for me. I said, ‘Yeah, she’s right. Why am I just going to sell an event or why am I just going to sell my podcast? I’m doing a lot of different things for entrepreneurs. How could I package those up as properties and instead of selling just a one-time event or one product, such as a podcast, why not say no, I’m doing so much more than that. And I just started thinking each one of these is a separate property that I need to package up and sell the benefits and the value that each property brings to the table so I create an ongoing relationship where I’m helping a corporate sponsor throughout the year. Not just with one thing or one event. And that’s when it home. And then part two of the story is, Stephen, you broke down Linda’s strategy for creating a sponsor proposal and that was gold for me. I was a very diligent about following it. I am a nerdy student of yours and Linda’s. I wrote it down and worked through the process on a quiet Saturday morning in my office and I filled in all the details for the proposal. The proposal ends up being a journey. Yes, you’re describing your company. Yes, you’re describing the properties, the value, the benefits, what’s in it for the customer. But what Linda adds to the proposal, which I’d never seen before in 20 years of being an entrepreneur and on the receiving end of many proposals, was ‘My Story’. And that’s what Linda does with her proposals. She has a compelling “rags to riches” story. So I wrote out my story about my mission, my why, what’s important to me, what makes me tick, and how I started the company. I was following my destiny. And I think people that are going to be reading this and have this read this proposal…I’m tugging on their emotions because they’re going with me on this journey of being an entrepreneur and they see yeah, I’m successful today, but they saw that well, in the beginning, this did all he could to be successful? To achieve his dream and to really pursue whatever he had to do in order to help people through what he was going to do with the business. And so I just talk about the journey of building the magazine and then what happened as that rose and then fell — and then how I’m rising again with a new business model of helping entrepreneurs start and grow businesses and how I’m doing that. So this guy I know, and I say “know” but he was a year older than me in high school, didn’t really know him in high school. He was the type of really nice guy, great family, if I’d see him on the street I’d say hello, maybe we’d catch up 30 seconds. But the point is — I didn’t know him that well. I think he was thinking I was going to suggest a test, for $5,000, sponsoring my TV show, and see what happens. Now it’s $30,000. It’s $2,500 a month for a year and across all my properties. And so we’ve had that meeting now. And really something crazy, so the P.O. is signed and we’re going to start the whole campaign in about two weeks. Stephen: Wow. So let’s go back and slice and dice some of these lessons. When you were talking about all of your different properties – you are referring to your website, TV show, Internet TV show, events and so forth, all of the different properties, right? So you packed up all of the properties, you identified them individually and then said to Paychex, ‘If you give me this podcast sponsorship or you buy this sponsorship, you become a sponsor of each of these properties. You’re sponsoring the whole thing.’ But you talked about each of them individually as individual properties, correct? Stephen: Onward Nation, I have Dave’s proposal here in front of me and let me just walk you through the sections and then I will ask Dave also to take us a little bit deeper into each of these sections. 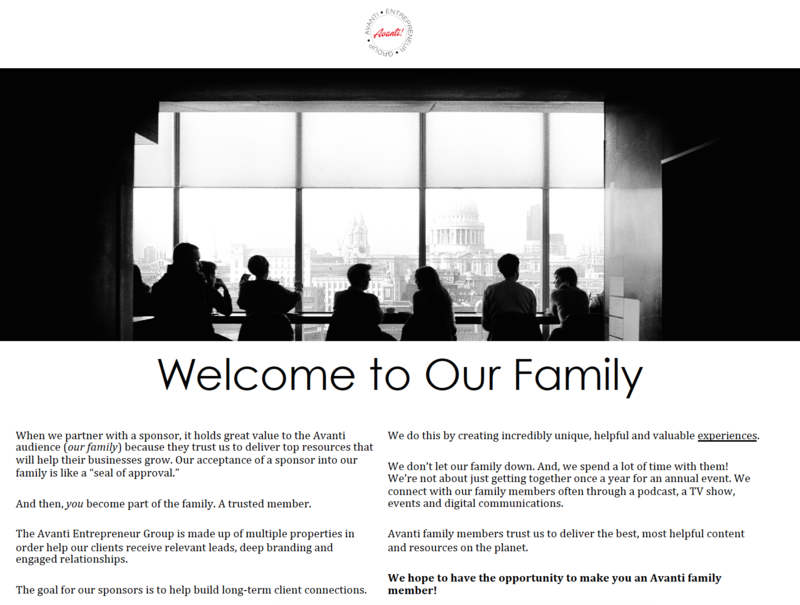 So the first main section he entitles ‘Welcome to Our Family.’ And that’s very consistent with Avanti, the culture, and so forth. But there’s an orientation right away into culture. Welcome to Our Family is that section. And then the next section after that is ‘Who We Are’ where he takes that a little bit deeper and with it’s definition and so forth, behind the word Avanti, to really start to marinate that prospective customer or sponsor, in this case, Paychex, into what Dave is building; what he and his team are building. And then after that, it goes even deeper into story. So let’s just recap here. It starts with Welcome to Our Family. And most people would stop there. Most businesses would stop there. But then Dave took it deeper and sliced Welcome to Our Family apart and went into Who We Are and then finally into Our Story. And each layer is getting more and more granular into what the special sauce is at Avanti. So before he ever talks about properties at all, he’s really going deep into culture. Do you think that would be a fair kind of summary, Dave? Dave: Yeah, absolutely. And we should probably say that anybody that knows me, culture is very important to me. And I am a family man and I treat my business like a family; not only my employees, my team, but anybody that does business with me, I want them to feel like I am treating them like a family member. I want to take care of them. I want them to come back. Stephen: Onward Nation, after Dave did that really perfect setup with culture, then he, I think masterfully, paid attention to the lesson from Linda, which is; it’s actually not about you at all. 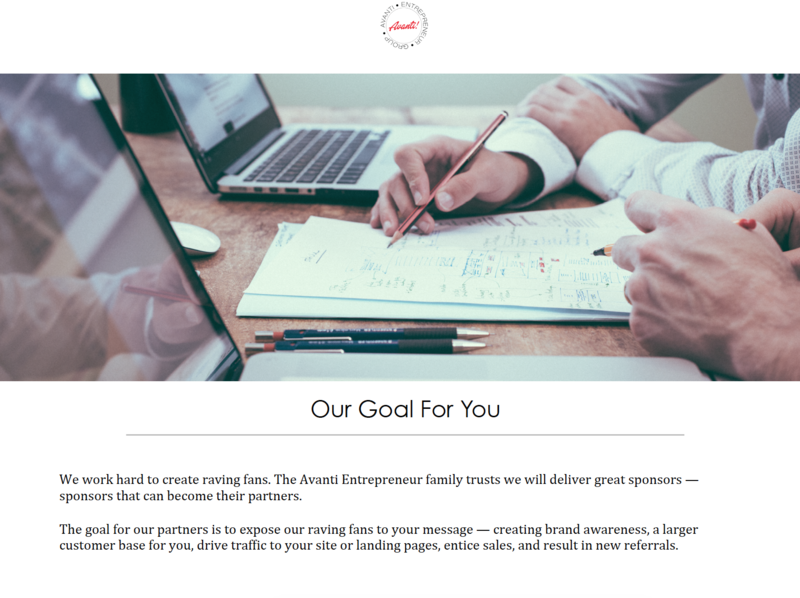 And it’s not about Dave and Avanti, even though he spent three slides, if you will, of setup, the very next slide in the proposal is, ‘Our Goal for You.’ Because that’s who it’s about. It’s about Paychex in this scenario, right Dave? Dave: Yeah, because at the end of the day, everybody’s favorite radio; What’s In It For Me, WIIFM, right? What’s in it for me? This is what we want for you. And I think it’s good to lead into that because now in the second part of the conversation, that’s where they’re going to be asking questions. ‘Okay, well what are we going to get out of this?’ And that really is like the second half. Stephen: And then after this goals conversation, the next two pieces, here, again, keeping Paychex front and center, Dave entitled it “How We Market You” and not “How We Promote Avanti” or “What We’re Doing to Promote Avanti” or “Where We’re Spending Money to Drive Traffic to Avanti”. 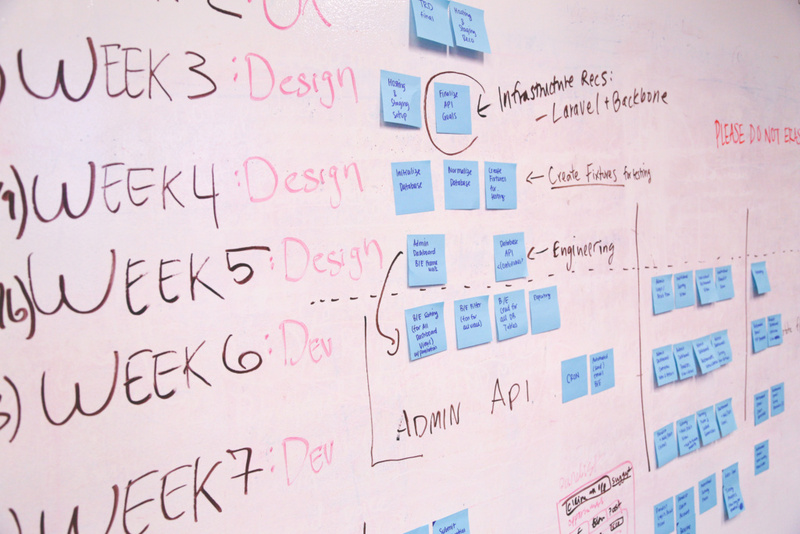 The context is focused on Paychex… “How We Market You”. So Dave, from Paychex’s perspective, do you think that was an important distinction? Because they see that this is all about them, not about you? Dave: Absolutely. The proposal definitely made them feel comfortable in the fact that I’m going to take care of them and that was the reason of my story, etc., but at the end, yeah, “How We Market You” is focused on them…it’s focused on their needs and their expectations of making this a successful relationship. So you’re right, we end with it’s all about how we can help them and what we’re going to do for them. Stephen: And in the final page, Onward Nation, is about sponsor investment where Dave masterfully didn’t itemize pricing on each of the properties, but instead presented the entire family of properties, and then the investment: $2,500 a month with a one-year commitment, or $30,000 total. What a great way to put a bow on it at the end, Dave. Dave: Yeah, you know what? I just wrote something down that you said. “Family of properties”. I started with “Family” and I’m going to end with family. I like that. Stephen: So in looking kind of back on how much time you invested in writing the story, taking Paychex deep into the culture and serving up the properties, like how much time would you guess that you invested toward the proposal? Dave: There was a lot of upfront time. So if anybody knows about the printing business, you know like 80 percent of the cost is in the setup fee, but once you’re rolling, you’re rolling. So I probably spent, I would say a good 10 hours listening to your solocast, the podcast with Linda, reading her book, and creating the template for the proposal, writing it out, working with Diana Fisher on my team, she’s my VP of marketing and she helped me wordsmith it, edit it, and then designed it. But here’s the best thing…I now have a template. It is made. Now I can easily take out the Paychex logo and wherever they’re intertwined in the proposal, which is very easy to do, and I can put in Bank of America, I can put in Grasshopper Phone Services, I can put in QuickBooks. So it’s made, it’s done, it’s rolling. The upfront investment of time, really when you think about it, was nothing compared to the value that it can bring to the table. Stephen: It sounds like you did not have to offer up any sort of exclusivity so you’re free to do exactly what you’re talking about. 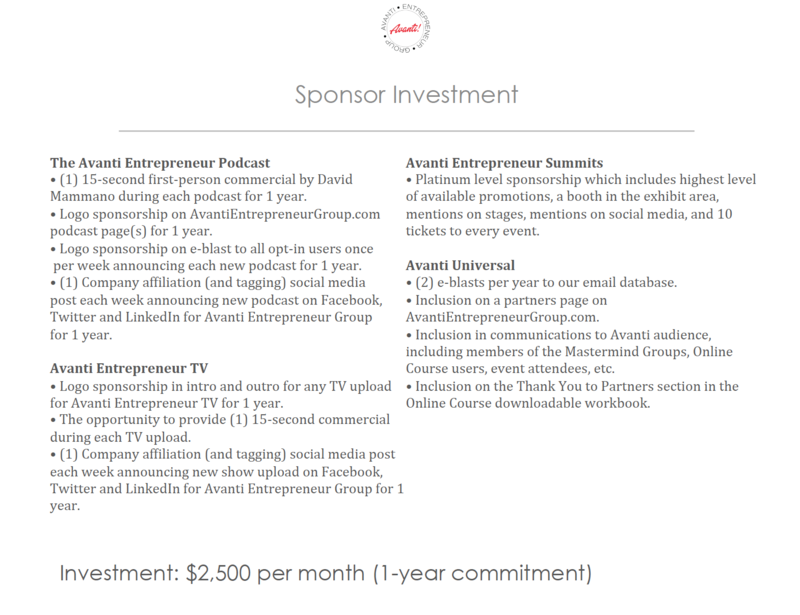 You could sell multiple $30,000 sponsorships to other companies, too. Am I hearing that rightly? Dave: Oh, absolutely. I’m going to sell these things like down the river. There is no exclusivity in the proposal, as I’m sure you saw. Out of respect, I’m not going to ADP, their major competitor. I think there are enough categories to market to beginning to middle stage entrepreneurs, small to medium sized businesses. So I don’t have to call on all other payroll companies now, I’m going to call on just different categories because I want, just like a family member, right? I’m going to show respect. They gave me a lot of trust and I’m going to honor that. Stephen: So Dave, Onward Nation can’t see the proposal right now, but if one of our business owners, one of our listeners, wanted to have a physical copy of it, could they email you? Would you be willing to share your proposal so they could use it as a guide for there’s? Dave: Absolutely. Just send me an email; david@davidmomano.com and we’ll have a conversation and send it to you and I’ll see how I can help you. Stephen: Dave, this has been fantastic. You did exactly what I was hoping; really took us behind the green curtain, we went step by step, you highlighted too big chunks as far as the properties piece when you learned that from Linda, and then the strategy proposal when Linda taught that. But before we go, before we close out and say goodbye, Dave, do you have any final advice? Anything you think we might have missed for any business owner who might be looking to sell a podcast sponsorship and then tell us the best way to connect with you. Dave: Yeah, well I want to end with just one cool little story and there’s some karma in it. So I told you I started the magazine back in 1995. So Tom Golisano is the founder of Paychex. And he’s a rags to riches story. Started with a credit card in his basement and built Paychex. And he’s owned the Buffalo Sabers, I mean, he ran for New York State Governor three times, he’s a big wig, right? And so I meet him at this nice Italian restaurant here in Rochester called the North Side Inn and we talk for like two hours. I’m the kid with the notebook, prepared, with a ton of questions. And he actually tweaked my business model. They were some pretty important tweaks that made a big difference at the time. He even paid for lunch. So now this is so cool…22 years later as I’m building a new business, biggest proposal I’ve asked for in this business, and it’s Paychex. So I just thought what a great full circle story. Stephen: That is a great full circle story and I didn’t know that. And wow, that makes this even that much sweeter. Dave: So to answer your question, yeah. If anybody wants to reach out to me, I’m very approachable and I’ll even give you my cell phone, it’s 585-317-8254 and my email again, david@davidmammano.com and we have two websites; davidmammano.com which is more about me, my speaking services, buy my book, etc., and then we have avantientrepreneurgroup.com which is where we really get into my podcast and our events and lot of the services that we do for entrepreneurs. Stephen: Dave, we all have the same 86,400 seconds in a day and I am grateful that you would come onto this show for a fourth time, that you would give us the opportunity to go so far behind the green curtain with you to really learn from you, your mentorship on this very important topic. My guess is you inspired many Onward Nation business owners to follow this recipe, to learn from Linda just like you did and to be able to apply it into their business right away so they can move onward to that next level. Thank you so much my friend. Dave: Stephen, it always is my pleasure. I truly enjoy being on your podcast, being your friend, and just talking with you in general.